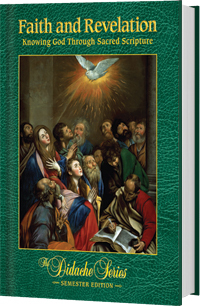 This text examines Divine Revelation, presenting Sacred Scripture as the inspired Word of God unveiled gradually throughout the history of salvation. It examines how the Magisterium of the Church transmits the Deposit of Faith infallibly and how our understanding of God's Revelation leads us to a more intimate relationship with the three Persons of the Blessed Trinity in this life and to eternal life in Heaven. It also explains how to read the Bible, emphasizing how the New Testament in Christ fulfills the covenants and promises that God made with his people in the Old Testament. *This book, Faith and Revelation: Knowing God Through Sacred Scripture, corresponds to Book I: The Revelation of Jesus Christ in Scripture in the curriculum framework. You will leave our website and be directed to a third-party vendor website.